Tampa International Airport offers a variety of food and shopping options. Whether you're looking for a pair of sunglasses, a last minute gift or a taste of Tampa at one of our home-grown restaurants, you'll find it here. Tampa International Airport has launched a $1 billion expansion project, the largest in the airport’s history. 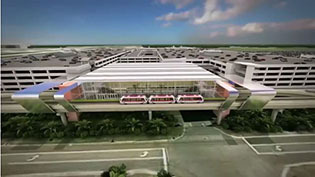 For an animated rendering of the project, click here. Visit our Master Plan page for details and updates. Tampa International Airport will hold FREE monthly Surety Assistance Training workshops designed to assist subcontractors secure surety bonding and/or increase their bonding capacity. Click here for more information on dates and times. Tampa International Airport is hosting an informational and networking session for janitorial businesses to learn about upcoming opportunities to provide janitorial services at Tampa International Airport. Click here for more information on dates and times. The Airport Insider kicks a 70 yard field goal at the Buccaneers stadium and hangs out with airport passengers. You can easily travel from Tampa International Airport to destinations throughout the region, including major downtown areas, tourist attractions and beautiful beaches. All your ground transportation questions are answered here.